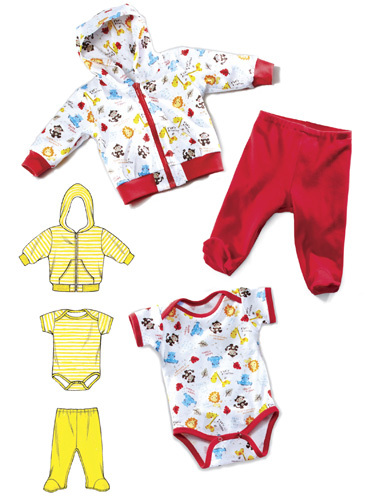 Kwik Sew pattern - Baby jacket has double hood, kangaroo pockets, front zipper, full length sleeves with cuffs, and waistband. Cuffs and waistband can be from contrast fabric. Romper has envelope shoulders, short sleeves, snap closure at crotch, and outer edges finished with contrast fabric bindings. Pants with feet are made from contrast fabric and have elastic in casing at waist. Pattern includes 1/4" (6 mm) seam allowances.